"I was looking at images after the flight that showed a blood red creek and was thinking, could this really be what I think it is? Can you really do that, surely not?" the pilot tells sUAS News. "Whatever it is, it was flat out gross. Then comes the question of who do I report this to that can find out what it is and where it is coming from." The pilot, who has asked to remain anonymous, was put in touch with the Texas Environmental Crimes Task Force, who began monitoring the plant for violations. 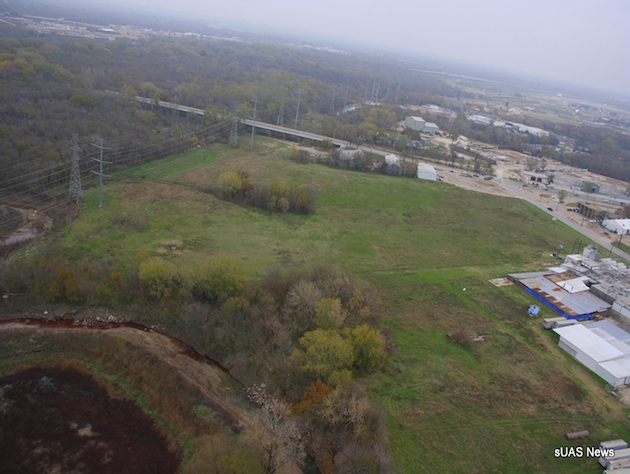 "Any time there is some type of discharge into the Trinity River… especially from an environmental standpoint, this is a real concern," Health and Human Services chief Zach Thompson told sUAS News. "I think they discovered a secondary pipe again is my understanding, so the question is who installed the pipe and why was it there." The drone hobbyist says he captured the footage from the plant using only a point and shoot camera and a $75 airframe.